Emerald Ash Borer (EAB) was found in Boulder, CO in September 2013. Since it was first discovered, the Colorado Department of Agriculture and the City of Boulder have confirmed that Emerald Ash Borer has been in the area for 3-4 years. They have also found the presence of EAB in other areas around Boulder County. 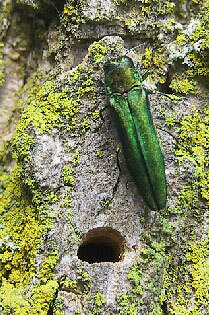 Emerald Ash Borer was first discovered in the U.S. in Michigan in 2002. It was carried to the country in wooden shipping supplies. Since its discovery, EAB has killed tens of millions of Ash trees in twenty-one states. As an exotic pest, U.S. Ash trees have not developed any defense against their attack. To help raise awareness and provide information about the issue in metro Denver and the Rocky Mountain Front Range area, Denver Parks & Recreation has set up the Be a Smart Ash campaign. Though Emerald Ash Borer has not been confirmed to be in the Denver area, now is the time to take action. If you have an Ash tree on your property that you plan on keeping for a long time, Donovan Arborists will develop a long-term management plan for it to ensure that it continues to thrive. If you are unsure whether or not you have an Ash tree on your Denver-area property, and whether or not it is healthy, read below for a few quick identification tips and very basic treatment information. Green Ash and White Ash are the two most common types of Ash trees found in the Denver metro area. Each type has opposite branching patterns, meaning that two branches come off the same main stem (one on each side and directly opposite the other). Ash trees have compound leaves containing 5-11 leaflets. Treatments for Emerald Ash Borer are systemic. A healthy, well-hydrated tree will move the treatment material more quickly and evenly throughout the canopy of the tree. Call us at 303-623-8733 or send us an online request for more information regarding this treatment and to learn whether or not your Ash tree is a good candidate. We'll walk you through the next steps.